As Archbishop of Buenos Aires, as you can note in the picture, Cardinal Jorge Bergoglio celebrated Mass in a prison, hospital or hospice for poor and marginalized people. This move from Saint John Lateran to the prison is consistent with Francis’ previous pastoral priorities. On 18 March 2007, Pope Benedict offered Mass in this same prison. In this Year of Faith there are some new books that have arrived and that are coming out to help all of us discover anew the the beauty of the Christian Faith. No one can ever say that they know it all, or, have heard it all before, and at the same maintain credibility in knowing the Truth. It’s not possible. Father Mitch Pacwa, SJ, theologian and EWTN host, is in the middle of a publishing campaign to help us respond with confidence to the proposals of the Year of Faith. Father Pacwa is a Chicago native who earned his undergraduate degree from the University of Detroit, a Masters from the Jesuit School of Theology (Chicago) before being ordained a priest in 1976. He also earned a PhD from Vanderbilt in Old Testament studies which included learning 12 languages. Father Pacwa offers the Mass in both the Latin and Maronite Churches. He is the president of Ignatius Productions. 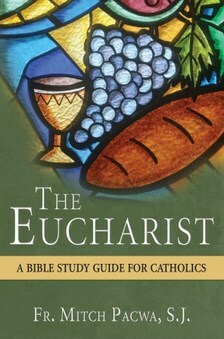 On 23 January, The Eucharist: A Bible Study Guide for Catholics will be released to the public. Order now. The Eucharist is published in order to draw connections between the Holy Eucharist and the Bible. The author looks at Old Testament types of the Eucharist, shows the centrality of the Eucharist in Christian life, what Eucharistic Presence means to call Jesus the Lamb of God, the meaning of sacrifice as applied to the Sacrifice of the Mass and more. [T]he sacraments constitute the events of a time which is the tension between the Resurrection and the Parousia …. Thus during the delay of the Parousia, the Eucharist prevents humanity, in this foretaste of celestial food …. And the Eucharist is the sacrament of unity which gathers about Christ of glory, present in the community, all nations in order to offer them through His hands to the Father. The full text of Mysterium Fidei is obligatory reading for those who want to be well-educated in the Faith. Emphasis added. Glory of the New Born Christ Child in presence of God Father and the Holy Spirit (Annakirche, Vienna) Adam and Eve are represented bellow Jesus Christ Ceiling painted by Daniel Gran (1694-1757). 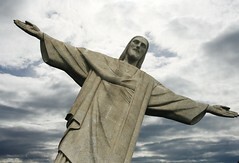 instills charity in them through the Holy Spirit whom He gives to us. The end times are indeed near at hand. That is not to say that the “12/12/2012” Mayan prediction of the end of the world is true –it is not– or that the rapture approach is insightful. But if you really believe that Jesus Christ is Lord and Savior then an acknowledgement of our living in the end times is the right way to live. The Scripture readings in these final weeks of the liturgical year, but especially this week, prepare the believer to face the fact of the final things, sometimes called the Four Last Things: death, judgement, heaven, and hell. We can’t get away from these things. If we could, then there would be no need of a Messiah, of the Cross and Resurrection, the Eucharist, the sacraments, the Church, and a spiritual life; no need for salvation. If there is no probability of hell, then there is no need of salvation. Read the Catechism at paragraph 1861. What ought be my approach to the four last things today, and in the years to come? Well, if I truly believe that Jesus is real, then the nihilistic approach is not a winning one. If I believe what Jesus exhorted us to consider as genuine, “Do not be afraid” then fear (sinful activity) can’t rule my life. If I believe that God is always present, then I ought to receive the sacraments of Confession and frequently receive the medicine of Immortality –the Holy Eucharist– reminding myself that Jesus told us that he’d be with us to the end of the world. His presence is neither magic nor fiction, but a real presence that no other warm body can ever give. These are the things that our spiritual life needs to be fed with, these are the treasures given by the all-loving, all-powerful God. So how can we honestly and proactively approach today’s feast, and this holiday season in a way that will get us past the public façade of wise-guy banter and beyond the disconnect between hard realities and sincere beliefs and honest ideals? How might we bravely allow our deeper humanity to shine forth in the midst of some extreme assaults on such things as tenderness, hope, and compassion? Today’s readings, along with monastic wisdom and psychological insight suggest the following: Daily if not hourly slow down the frantic pace of our media interaction, verbosity, and endless tasks: daily if not hourly return to the temple of our own person and the holy and fertile ground of our interior life. Daily if not continually express appreciation for whatever someone does that makes my life richer today: Daily or at least once in a while do something simple but concrete and different, for the express purpose of nurturing the human spirit, within yourself, for someone else, and for the future. In these days in the post Christ the King observance and before Advent, let’s pray for the grace to know ourselves more deeply so as to accept more fully “divine work” in our lives with the gift of discernment showing us the way to the Father.